Contemporary RPGs have been a fascinating sector of the industry to observe over the past few years. Many modern works have embraced evolving the genre with active real-time battles, gorgeous 3D visuals, open-world navigation, enhancements via crafting, and the list goes on. RPG elements are practically in every game these days with the staples of loot and level progression to raise arbitrary stats. The massive push to 3D in games gradually left a gaping hole in RPGs; those who loved massive adventures through the lens of adorable pixelated sprites were suddenly left with much fewer options as the years piled on. Several indie titles have certainly pumped out some stellar ones here and there, but there’s undoubtedly a sense of yearning for a big, brand-new game to capture hearts the same way as the older Final Fantasy games and many other classics in the Super Nintendo and PlayStation era. 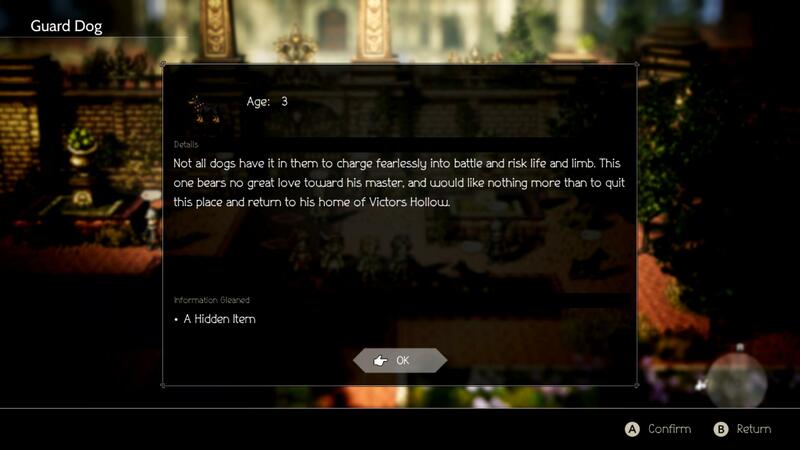 Octopath Traveler especially calls out to those who fell out of RPGs as technology progressed. It immediately oozes that sense of nostalgia; familiar pixelated sprites running around open spaces, but they can travel along a Z-axis of depth and stand out like a pop-out book among it all. There was an inherently charming air surrounding it for me as if I was revisiting an old friend. I think Octopath Traveler hits an astounding amount of right notes, but there are just enough fundamental hurdles it stumbles upon that prevent it from being great. Its foundation prides itself on a non-conventional approach giving players the freedom to choose how they want to play. Choose one of eight protagonists and after clearing their starting chapter, they’ll be off wandering the continent of Osterra to recruit the others. Players can tackle these in any order they want and once their fourth party member joins up, they’re free to progress the stories of those characters and hold off getting the others later. This type of open-ended narrative is surely flexible, but the game had to make a disappointing compromise to make it work. 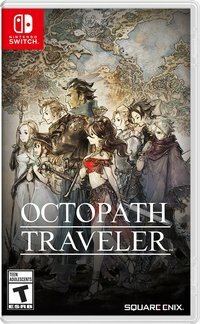 Think of Octopath Traveler as a compilation of eight separate short stories. Each character’s story is strictly siloed off from one another. Their tales never directly intersect, so plot beats only take a single character into account at any given time. Minute background details link some stories together behind-the-scenes, but the most “direct” interaction between your party members take the form of small character banter parts throughout a story section. Imagine those skit segments in the Tales of games and then having that be the only times the characters acknowledge one another at all. I personally didn’t mind this too much at first; in fact, I thought it was a little refreshing. Every character’s arc is fairly decent. None of them are especially deep nor bring something new, but the stories they share are engaging and interesting enough to follow through on why each character has decided to venture out into the world. Some have darker themes than others and some carry a more whimsical tone - it feels good not having to worry about some looming universal villain with a god complex. 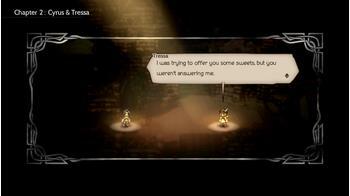 Octopath Traveler is more concerned with telling solid personal stories. These small chat scenes between your party members are really the only time your party members properly speak with one another at length. This all feels endearing but only for so long. I was even willing to accept the super flimsy, awkward way characters meet one another for the first time due to the malleable narrative structure. Then it starts putting characters into more and more situations that simply can’t account or endorse the other characters’ existences leading to scenarios handled in a slipshod manner. Scenes like convincing an NPC to let one more person on a carriage or an inexperienced fighter somehow overcoming a mercenary at an isolated area only widened the cognitive dissonance it wrought even further. An alternative angle to frame the narrative is that the stories are being told to the other travelers at a tavern as more of a retrospective; after all, you can select to hear the tale of these stories in their respective town taverns if you don’t want to start them immediately. Then it makes the characters being there and the banter scenes even feel more out of place. It’s a difficult problem that Octopath Traveler doesn’t shake off. Those looking for wholesome character interactions involving all of the protagonists in some unified way will sadly not find it here. It’s a shame because a lot of the appeal in many classic RPGs back then were story scenes that involved goofy interactions and antics from the main characters. There was a certain shared bond that brought out the best in them as these memorable heroes and heroines grew together. Octopath Traveler also has trouble varying up the way it presents its story. Each chapter is structurally the same - you’re introduced with a premise, use a character’s Path Action to progress, something occurs to justify having you go through a dungeon area, beat the boss at the end of that, and then wrap-up the chapter. The events themselves can be neat at times, but it clings too hard to its formula that it dilutes any potential sense of surprise. A lot of care was put into making the world feel alive. Some of the descriptions for random NPCs are simply adorable. For all of its numerous faults in the narrative, I loved the way the game plays. Traveling throughout Osterra was a delight. There’s no shortage of different environments, weather conditions, and stunning sights to see. It all looks wonderful in its self-imposed “HD-2D” presentation. Octopath Traveler’s outstanding soundtrack really took me back to that golden era of RPGs; it hits lush moments well and isn’t afraid to kick it into high gear with an upbeat tempo resulting in a powerful melody. I think it does takes it a step too far with its depth of field blur to the foreground and background on top of a some heavy vignetting to accentuate the action at the center. It comes off like a stage play during events, but it was tough for me to get fully behind it as I was wandering about. The vignetting in particular made it tough to find small pathways to chests in dark caverns leading me to hug walls hoping to find them. Turning it off alleviated some of my problems, but the intense blur from the depth of field has no similar toggle, unfortunately. 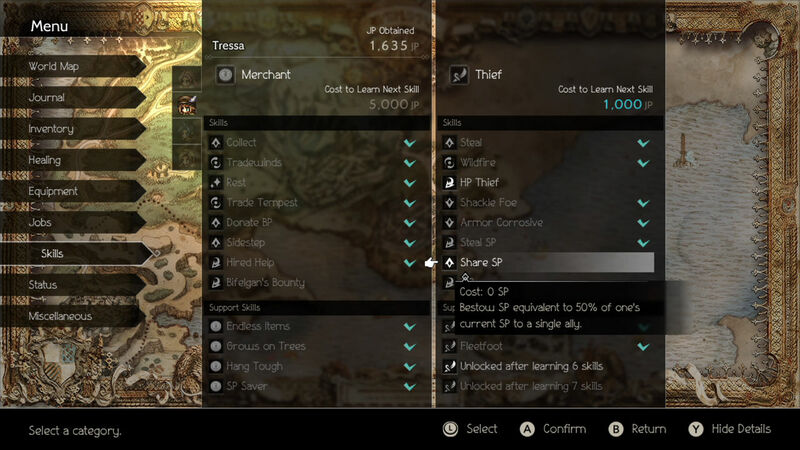 Towns and villages are enjoyable to tinker with thanks to Octopath Traveler’s Path Actions for its characters. Think of these as ways to interact with NPCs through the mannerisms of Mass Effect’s Paragon and Renegade options - characters either have a “polite” or “rude” Path Action that carry their own pros and cons. Tressa can buy items off a NPC for instance, but Therion has a chance to swipe it instead. Of course, saving money is ideal but if you fail to steal it, your reputation will go down and if that’s completely diminished, you can no longer use any Path Action to anyone in town unless you pay the tavern keeper a hefty sum to spread positive rumors about your party to restore it. 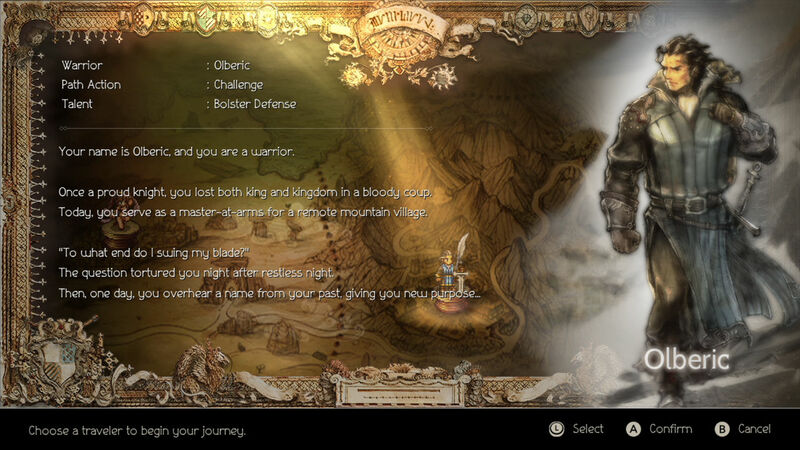 This gives a lot of life to Octopath Traveler’s world. 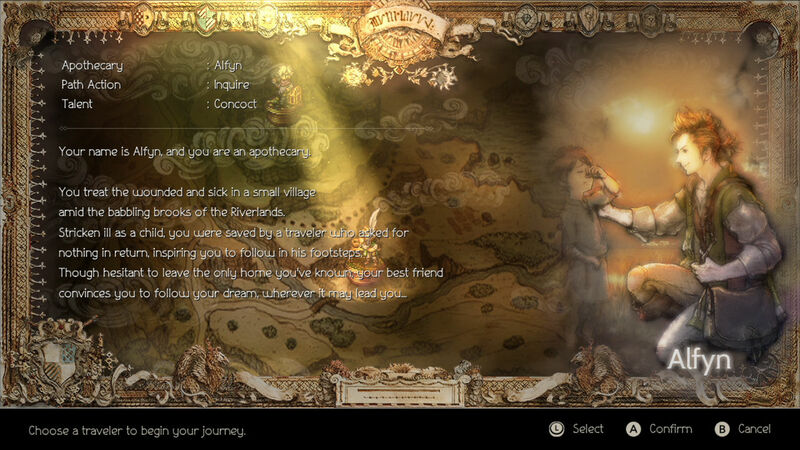 Each NPC has a neat little background you can learn about thanks to Cyrus and Alfyn. You can challenge them in little duels with the aid of Olberic and H’aanit. NPCs can even follow you around and aid you in battles as long as Ophilia and Primrose are with you. 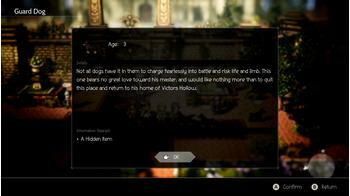 Path Actions are also used in the myriad of small sidequests scattered around as well. It’s a lot of fun to engage with these systems upon entering a new place. 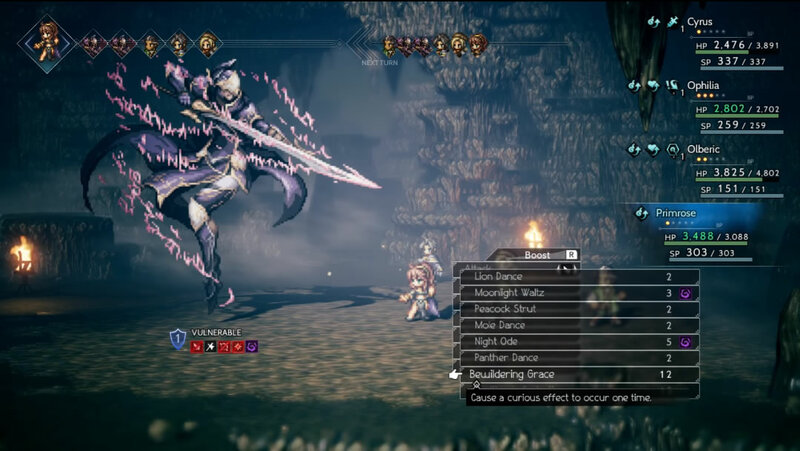 I love the little touch of Octopath Traveler's enemies having varying sizes. Important boss encounters have oversized sprite models nodding back to the classics that did. Battles are one of the game’s biggest strengths. It rewards preparation and strategy above all. 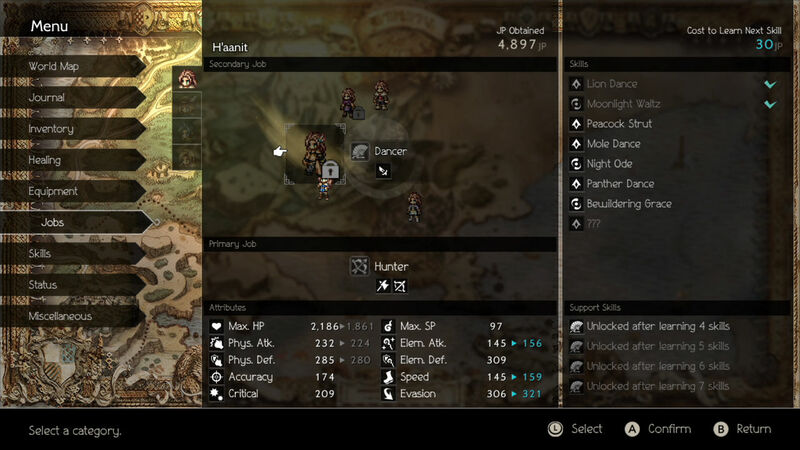 Though it’s a traditional turn-based combat system, Octopath Traveler gives players a lot of tools to strategize. Each enemy will display their set of weaknesses and a shield icon with a number on it. Hitting those weaknesses brings that shield’s counter down and breaking it will leave them in a vulnerable state to receive more damage from attacks and prevent them from taking a turn momentarily. Characters can cash in Boost Points to attack multiple times, increase an ability’s damage, or lengthen a spell’s duration. 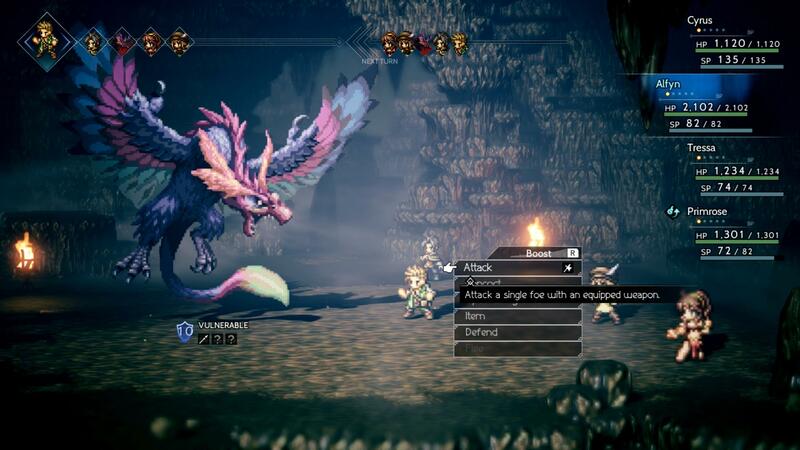 Couple that with everyone’s unique talent like Cyrus being able to identify an enemy’s weakness at the start of battle or H’aanit’s skill to capture monsters to summon in battle - Octopath Traveler’s combat is just incredibly robust. It's great that the combat is entertaining because the game does feature a heavy reliance on grinding out levels in order to be set for the next major challenge. People who are opposed to grinding should be warned - there'll be a lot of it, and more than your average modern Japanese RPG. It's exacerbated by how reserve party members don't pick up any EXP at all, but each character's story will require they specifically be leveled up to survive. Story chapter requirements are no slouch either; if you're planning to follow a character's route before touching the others, know that the level gap between chapters are generally severe. The next chapters after the introductory ones ask that you be around your mid-20s and the ones following those are already asking you to be nearly 40 soon after. There's occasional frustration as a result, though I didn't mind it too much in the grand scheme of things. Each of the eight characters has a starting job, but secondary jobs can also be acquired. Secondary jobs allow characters to access their weapons and learn their skills along with their passive abilities that unlock the more skills you learn from them. Though the active skillsets themselves won’t stay with a character when they take on a different secondary job, the passives will, giving you a strong reason to sink points into a variety of classes to get the passive skills you want. 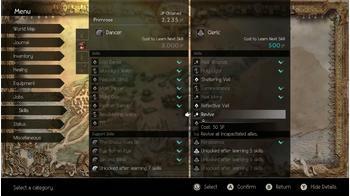 Secondary jobs and advanced jobs bust open the full potential of Octopath Traveler's combat system. There's just so many tactics and builds to try out. It's awesome. Thus, Octopath Traveler lends itself extremely well to theorycrafting and experimentation in battles. 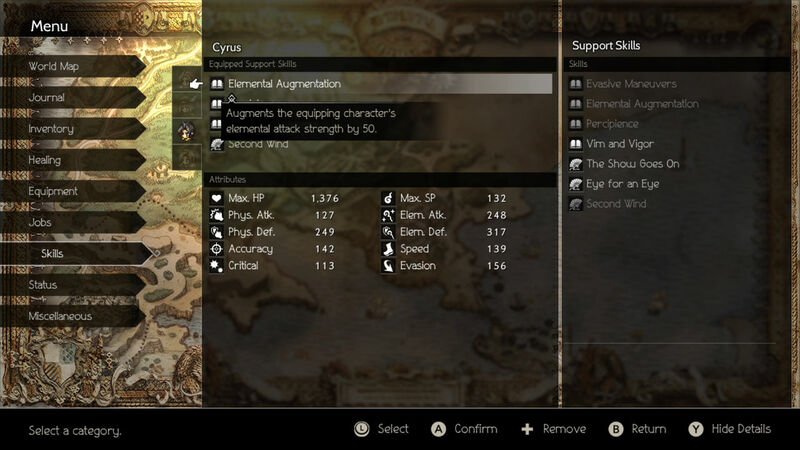 Cyrus expends a lot of SP thanks to his heavy reliance on offensive magic, for instance, but specific passive skills in some secondary jobs reduce the amount of SP spent and can even regen SP per turn. 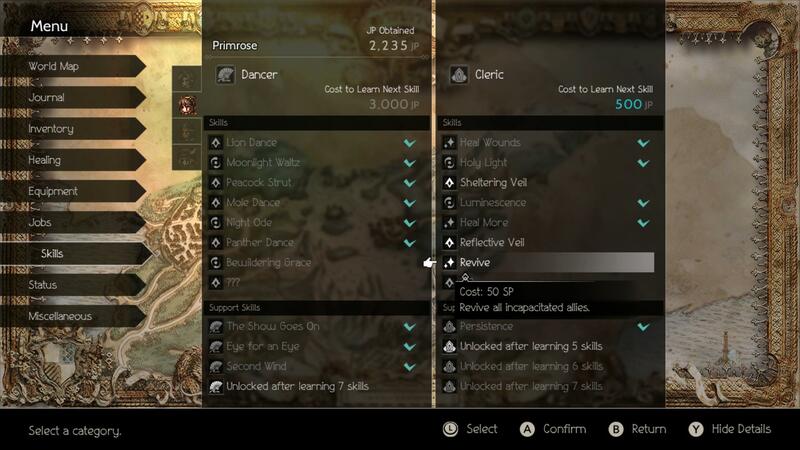 Trying out different combinations and parties with the extensive job customizations was easily one of my favorite parts of Octopath Traveler. It opened up the game for me and there are a few high leveled secret advanced classes to bump it up even further. All of these aspects of combat really come together in the game’s stellar boss battles. These are often quite brutal and are filled with additional mechanics pushing players to balance their offensive and defensive capabilities efficiently. 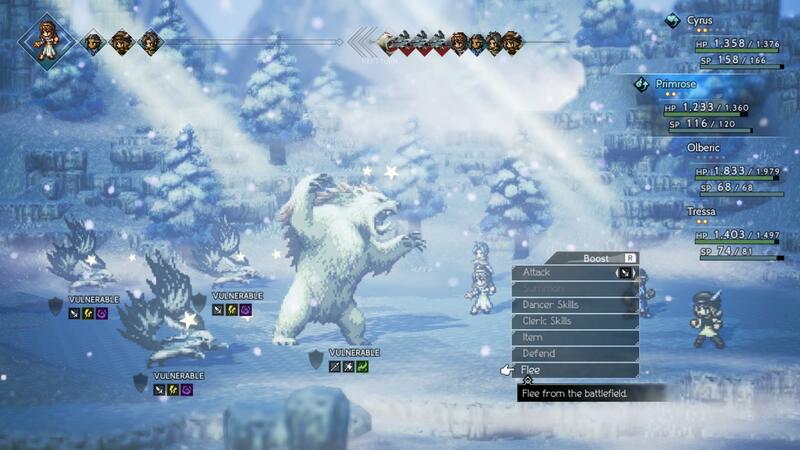 The bosses marry Octopath Traveler’s turn manipulation and subclassing systems wonderfully, leading to lengthy, stressful and rewarding encounters that really test your knowledge and party build. I really want to love Octopath Traveler, but the messy nature of its story presentation is ultimately an enormous weakness. That stands out, but this game is also truly one of the most intriguing evolutions of the 'golden age' RPG formula out of Japan, managing to both build on and pay homage to the classics. I don’t particularly mind that Octopath Traveler is a collection of eight separate stories, but the lack of any sort of cohesion even among the party members bogs it down and makes the stories that are there ring slightly hollow. Octopath Traveler is an excellent game, but the elasticity of its structure proves to be the one unassailable hurdle between it and becoming a classic in its own right.